5982 20PI 6 Pfg. 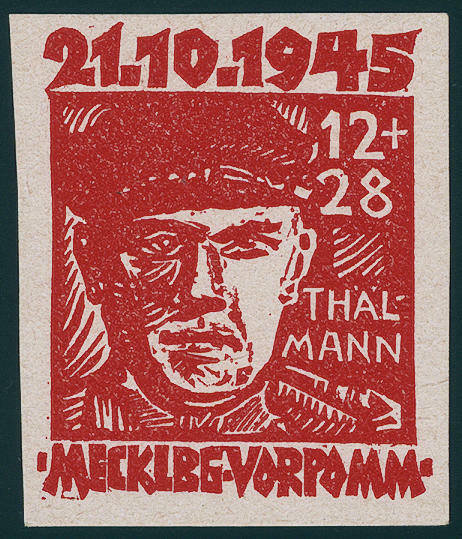 Victim of the fascism, proof on gray ungummed cardboard paper, in perfect condition. Rare. Expertized. Zierer BPP, Thom BPP. 5983 20PIIIU 6 Pfg. 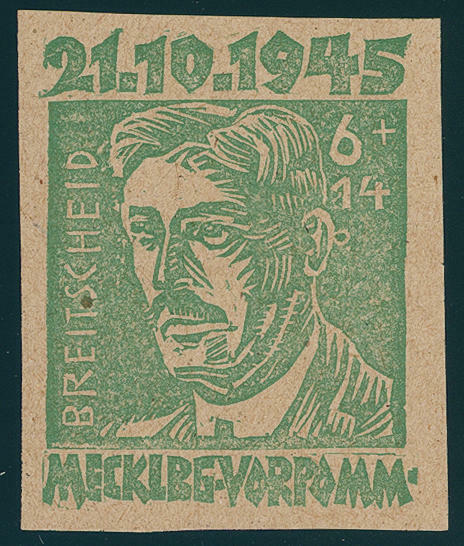 Victim of the fascism, unperforated proof on thin gray brown paper, fresh colors in perfect condition. Only a few examples are known. Expertized. Thom BPP. 5984 20PIIIU 6 Pfg. 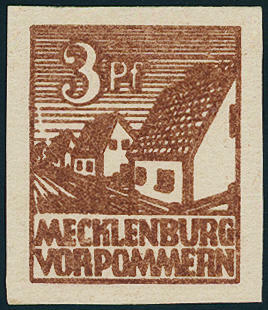 Victim of the fascism 1945, proof on thin, ungummed, gray brown paper, in perfect condition. Very rare! Photo expertize \"genuine and in perfect condition\" Kramp BPP. 5985 20PIIU 6 Pfg. 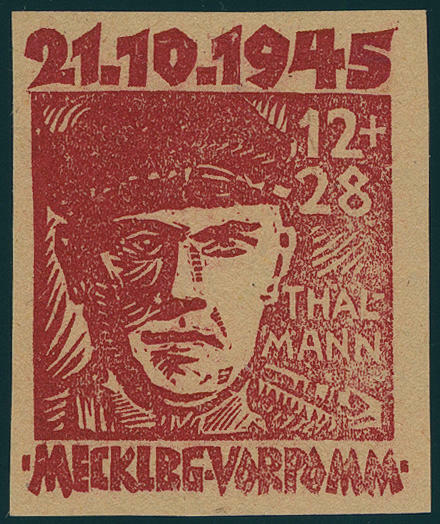 Victim of the fascism 1945, unperforated proof on ungummed rose paper watermarked honeycomb, fresh colors and with wide margins in perfect condition. There are only few examples from this known! Photo expertize \"genuine and in perfect condition\" Kramp BPP. 5986 20PIIUDD 6 Pfg. 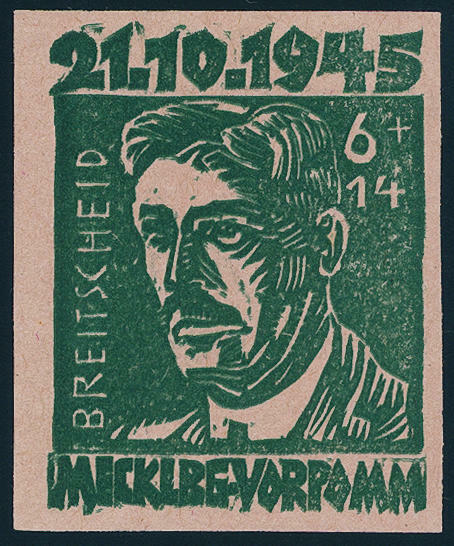 Breitscheid, unperforated proof on rose paper watermarked honeycomb and double impression, fresh colors and with wide margins, faultless condition. There are very few examples from this known! Photo expertize \"genuine and immaculate\" Kramp BPP. 5987 22bU 12 Pfg. 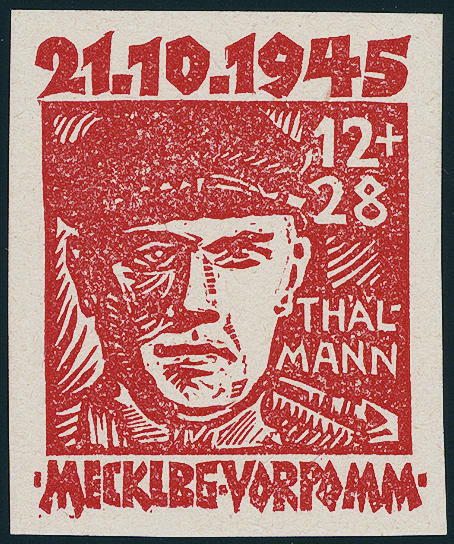 Victim of the fascism, orange red, unperforated, from of the right upper corner of the sheet, fresh colors and in perfect condition mint never hinged an Exceptional copy this very rarely variety. Photo expertize Thom. 5988 22bU 12 Pfg. Orange red, four sides unperforated, fresh colors and in perfect condition mint never hinged a very scarce variety! Photo expertize \"genuine and immaculate\" Kramp BPP. Michel 1200,- €. 5989 FDC 22c 12 Pfg. 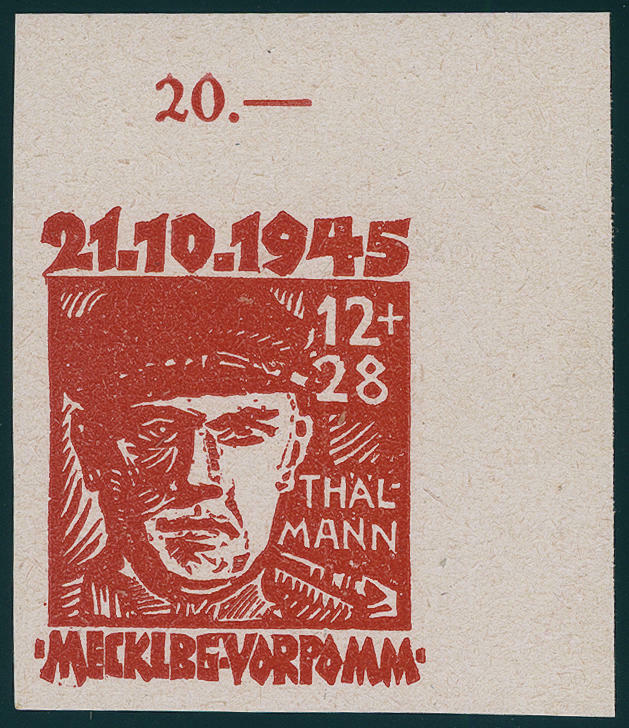 Dark red, the extremely rare colour with additional vertical double perforation right, in perfect condition on First day card with the both others values the anti-fascist set and clearly first day cancel`s \"SCHWERIN 21.10.45. \". Already lots used is these colour extremely rare. On cover becomes these in the Michel special catalogue only noted without price. 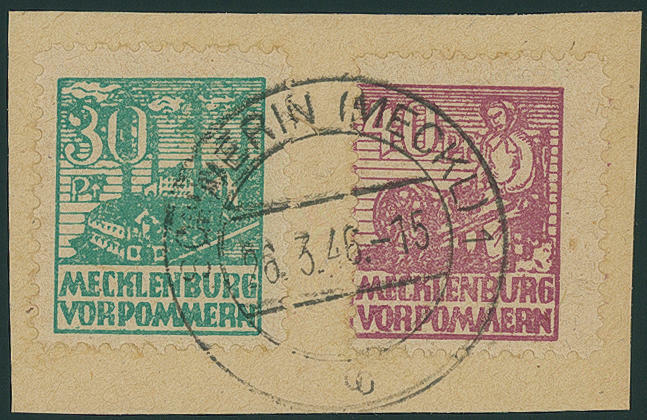 As First Day Cover also there unlisted and one of the most important rarities from MECKLENBURG-WESTERN POMERANIA! Photo expertize Zierer BPP. 5990 22cKU 12 Pfg. 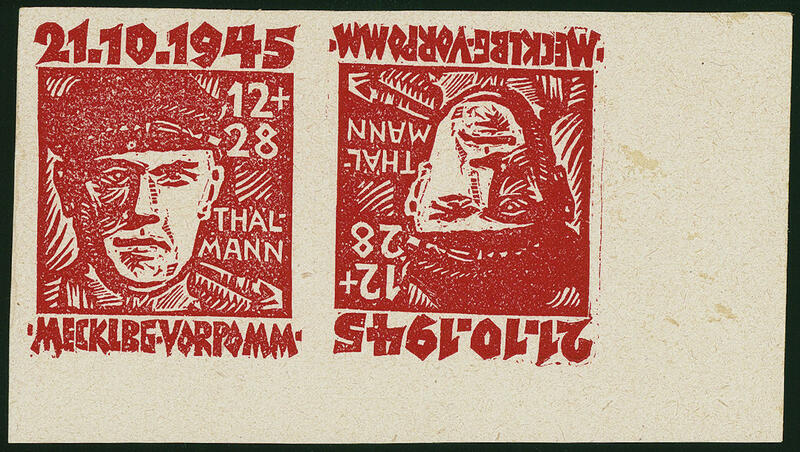 Victim of the fascism 1945, the scarce dark red colour unperforated in the horizontal tête-bêche pair from of the right lower corner of the sheet, fresh colors, unused, slight traces of rubbings in the margin of sheet become only as a matter of form mentions. A spectacular rarity of the SBZ. 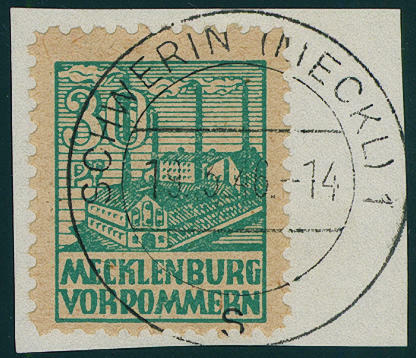 Already the normal stamps belong to the rarities of this area. 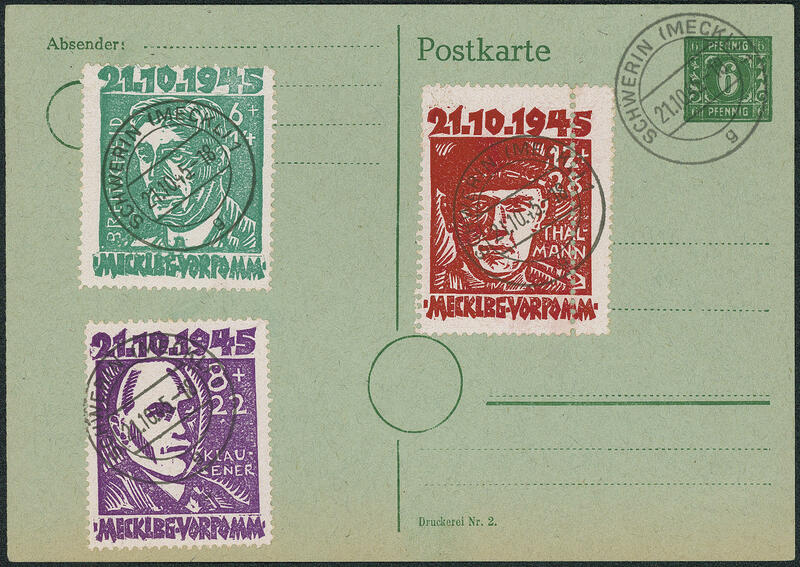 This tête-bêche pair places one of the largest valuables of the German postwar Philately dar. For many years offered no more also in the Michel special catalogue hopeless undervalued. 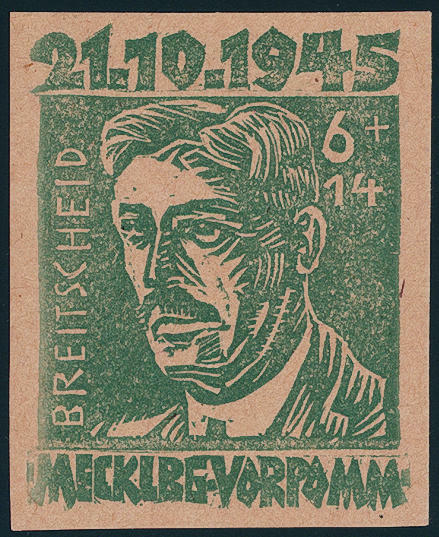 Already the normal stamps to notice by far above the tête-bêche. A piece of dream invaluable! Photo expertize Kramp BPP. 5991 22PIIIU 12 Pfg. 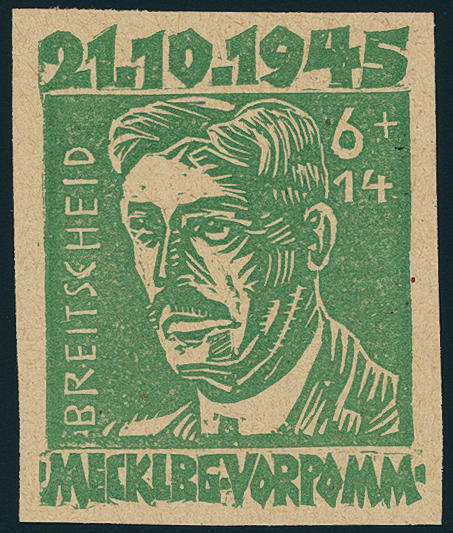 Victim of the fascism, unperforated proof on thin gray brown paper, fresh colors in perfect condition. Only a few examples are known. Expertized. Thom BPP. 5992 22bU 12 Pfg. Orange red, four sides unperforated, in perfect condition mint never hinged a very scarce variety in this good colour. Photo expertize Kramp BPP. 5993 24cUMs 8 Pfg. Yellow brown, horizontal pair, centered unperforated, fresh colors and in perfect condition mint never hinged. Expertized. Thom BPP. Michel 300,- €. 5994 25bUdr 12 Pfg. 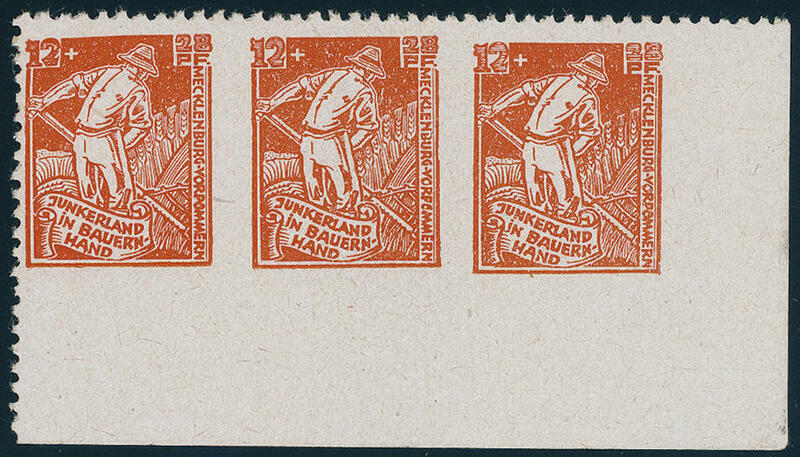 Red orange, horizontal strip of three from of the right lower corner of the sheet, the right stamps three sided unperforated, the left stamp two-sided unperforated, in perfect condition mint never hinged spectacular varieties rarity, because these part perforation also in the Michel special catalogue unlisted are. In this kind probable unique! Photo expertize \"genuine and immaculate\" Kramp BPP. 5995 26bDZ V 6 Pfg. 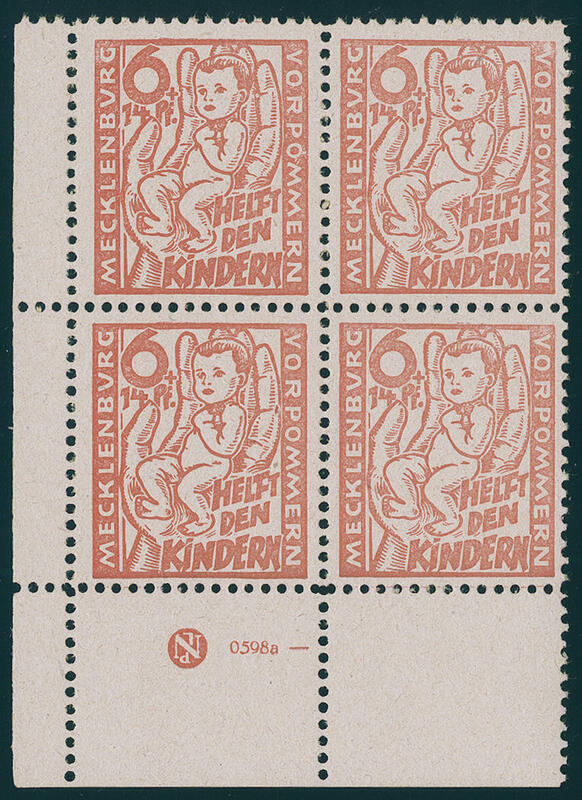 ChildrenÂ´s help, in the good colour pale reddish orange, block of four from the left lower corner of the sheet with printer sign, with the plate flaw: small finger broken, in perfect condition mint never hinged extremely rare! Expertized. Kramp BPP. 5996 27aPa 8 Pfg. Pale ultramarine, vertical pair with glued paper web, small faults, fresh colors and very well perforated, extraordinarily rare, photo expertize Kramp BPP. 5997 ⊙ 29/40 Farewell series, all values on white paper, the 20 Pfg. And 30 Pfg. 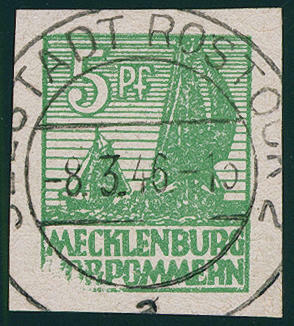 On gray paper, very fine centric cancellation \"maritime city ROSTOCK 8.3.46. \", photo expertize \"genuine and immaculate\" Thom BPP. 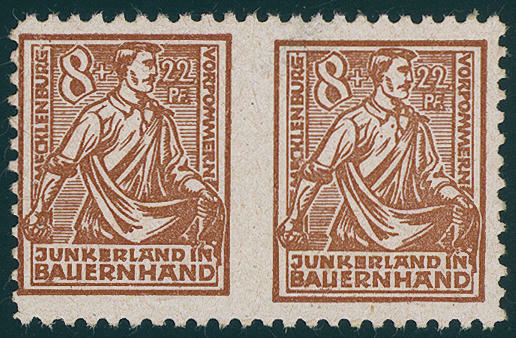 5998 ∆ 29/40y Farewell issue 1940 gray paper, on beautiful white letter pieces, uniform perfect used \"SCHWERIN 19.3.46. \", the 30 Pfg. On good paper za, these and two more values expertized Kramp BPP. Michel 500,- €. 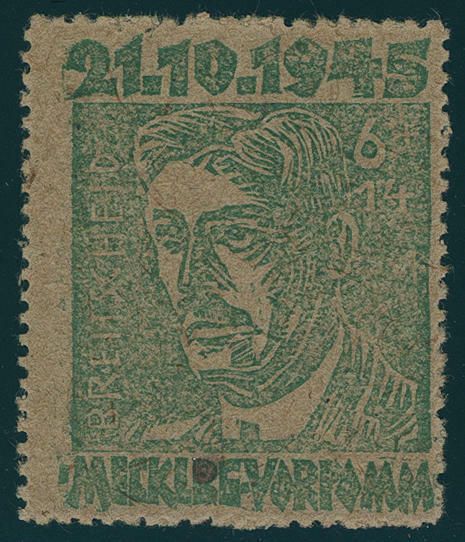 5999 ∆ 29/40y Farewell series 1946 on gray paper, all 11 values on letter pieces, in perfect condition and neat cancelled \"SCHWERIN 26.3.46. \", expertized Thom BPP. Michel 300,- €. 6000 29P 3 Pfg. Dark yellow brown, unperforated proof on ungummed cardboard paper, large margins all around and fresh colors in perfect condition. Additional carries the proof the plate flaw IV. In this kind probable unique! Photo expertize \"genuine and immaculate\" Kramp BPP. 6001 ⊙ 29xbIV 3 Pfg. 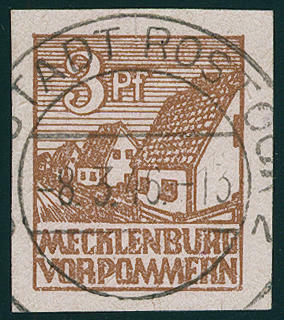 Dull orange brown, the scarce colour in the vertical pair from upper margin, both stamps with good plate flaw IV, very fine centric cancellation \"SCHWERIN 6.3.46. \" (False attitude! ) in approximate perfect condition. Photo expertize Kramp BPP. Michel 1700,- €.